Laboratory analyses of environmental waters is important for identifying water conditions, contamination as well as for ensuring drinking water quality. Eurofins is IANZ accredited for a wide range of tests and has extensive experience in the sampling and analyses of environmental waters. We perform comprehensive chemistry and microbiology tests on all environmental waters, and specialise in metals, BOD, nutrients and organics analysis. For environmental Soils analysis, please see Contaminated Land, and Agricultural Testing pages. Screening of environmental water quality usually involves a range of chemical and microbiological tests that together form a good profile of the analytes present. This could be Groundwater, Surface Water, Receiving Waters, Marine or River Water. The usual reason for analysing natural waters is to monitor nutrient levels over time, in order to identify trends. These trends can indicate a contamination of natural waters, which if found early enough could be corrected. Nitrogen forms many different species in the environment. This chart can assist you with some of the terms used for nitrogen and its different states. Phosphorus is the second commonly analysed environmental nutrient, and like nitrogen it can take many forms. 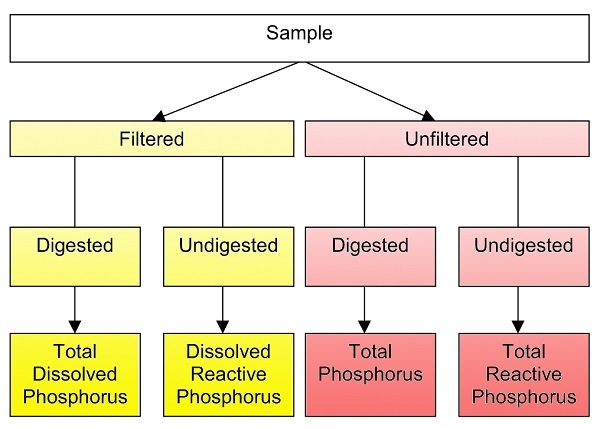 Four forms of phosphorus are commonly analysed in New Zealand – please see the attached chart for more information. We work with councils adhering to the guideline values detailed in a document prepared by the Ministry for the Environment called: Microbiological Water Quality Guidelines for Marine and Freshwater Recreational Areas published in June 2002 and updated in June 2003, which details the sampling program, frequencies, and analytical techniques that are used. We are IANZ accredited to carry out sampling and testing to meet these requirements. Laboratory analysis can be used to find sewer breaks and illegal sewer connections. Elevated microbiological counts can indicate a source of sewage, as can some chemical analyses. Where fluoride has been dosed into a water supply, laboratory analyses can identify its presence. In a clean stormwater system there should be no fluoride except for the proportion introduced by seawater. Where contamination of stormwater is suspected, we can analyse samples to confirm the type of contamination. This can then lead to remedial work to identify the source and to clean up the ecosystem. Mussels are filter feeders and are known to concentrate contaminants such as metals and viruses. Even though virus infection is specific to the species it came from, they can live long enough inside a mussel to return back to a human host. Eurofins can provide a testing service to monitor the health of a receiving water environment. Please Contact Us or download our Environmental Testing brochure for more information.